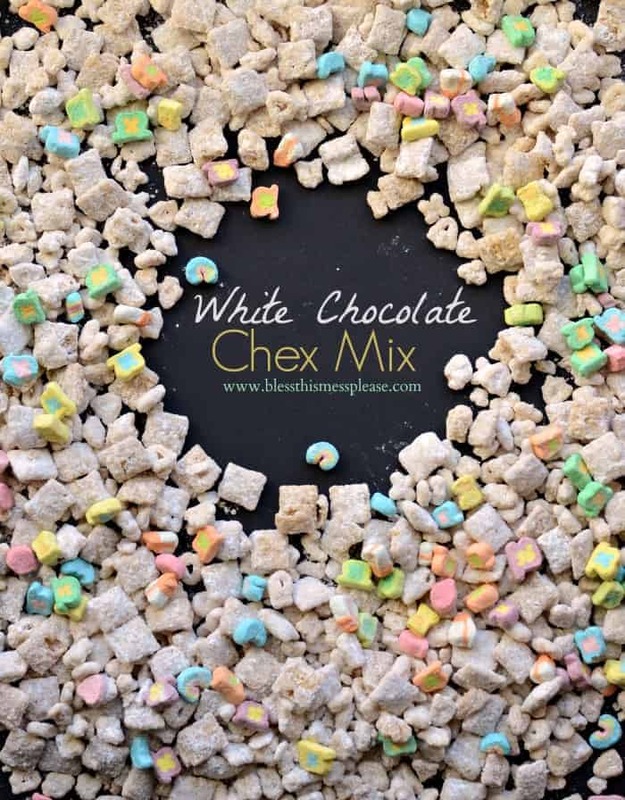 This White Chocolate Chex Mix is a cross between Puppy Chow and Lucky Charms. It is pretty and delicious, and makes for a fun treat! Happy National Cereal Day! I’m not one to celebrate all of the national food days, but I had just the recipe in mind for today. We don’t eat tons of cold cereal, but we do love it when we have it! 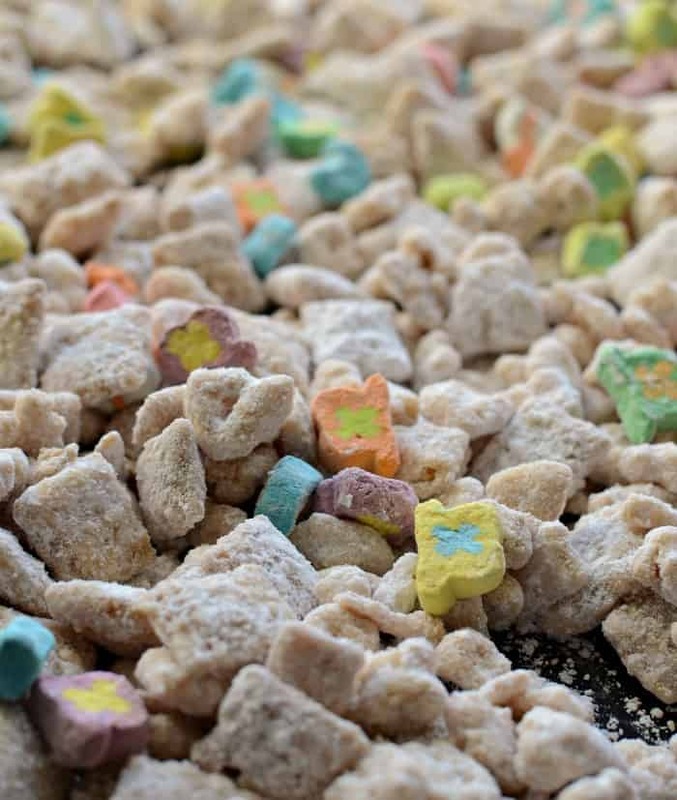 Chex is always a favorite and I’ve been craving Puppy Chow (or Muddy Buddies if you prefer) for ages and got to thinking about how fun it would be with Lucky Charms involved! I love Lucky Charms. I ate them almost every morning my freshman year of college and I think they make an excellent topping for ice cream. 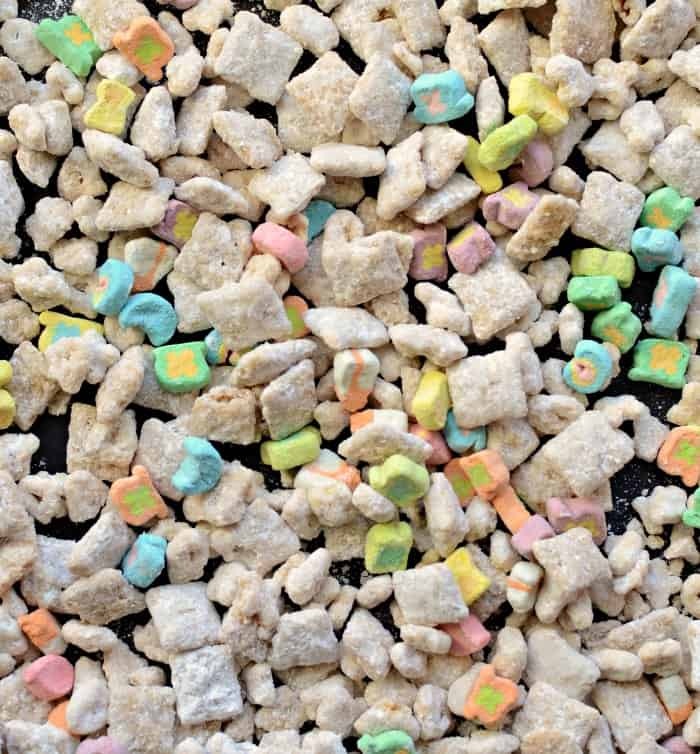 Lucky Charms plus Puppy Chow sounded like a smart idea to me! 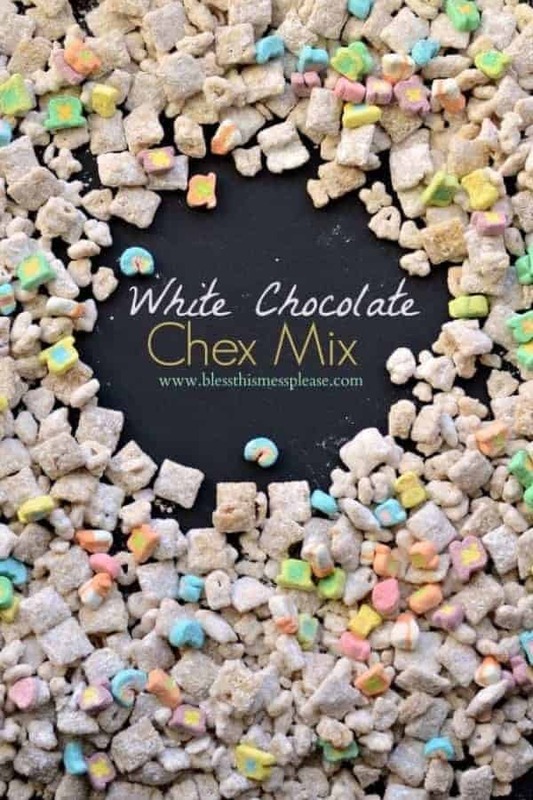 I wanted the marshmallows to really stand out, so instead of your normal chocolate chips I chose to use white chocolate chips so that the color of the Chex mix would be very white. It’s pretty and delicious! My kids don’t get sugar cereal regularly but every year for St. Patrick’s Day they find a box of Lucky Charms along with green milk waiting for them for breakfast. It’s a surprise they look forward to, and I’m ok with a fun little treat for breakfast now and again. Imagine their surprise when I made this white chocolate Chex mix for their after school snack on Friday and it was plum full of those coveted little marshmallows. Love at first sight! Our leprechaun leaves a scavenger hunt for the family every year and I was thinking this would be a really fun treat to find at the end of the hunt! This would be such a cute St. Patrick’s Day treat, scavenger hunt or not. If you are planning on serving this later in the day or even the next day leave the marshmallows out until you are ready to serve. They start to absorb the moisture in the mix and get soft if you leave them over night. In a large bowl combine the cereal pieces from the Lucky Charms and the Chex (leave the Lucky Charm marshmallows out for now). In a medium microwave safe bowl add the white chips, peanut butter, butter, and vanilla. Microwave on medium power until the chips are melted, about 2 minutes (stirring every 30 seconds). Pour this mixture over the cereal and stir well to combine. Let the Chex mix cool for a minute or two and then add 1 1/2 cups of powdered sugar and stir well to combine. Let the mixture finish cooling, about 10 minutes, and then add the remaining 1/2 cup of powdered sugar (this last little bit will make the Chex mix more white and won’t absorb into the chocolate as much). Stir in the Lucky Charm marshmallows and enjoy! 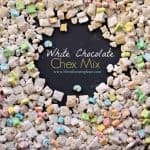 Enjoy some cereal today and plan on this White Chocolate Chex Mix with Lucky Charms for your next movie night. It’s a keeper!